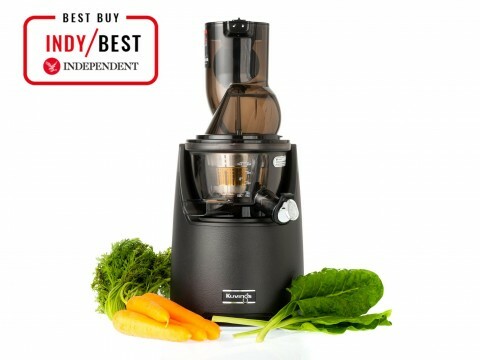 Introducing 11 different juicers, The Independent especially compared “EVO820” to the Rolls Royce of juicers, mentioning that there was no need to buy many kitchen appliances and EVO820 was worth the investment. Kuvings’ EVO820 has an 82mm chute to fit in all kinds of round fruits such as apples, oranges, lemons, and kiwis without having to pre-cut them. Unlike existing products, you do not need to pre-cut ingredients. This product has become highly recognized when it comes to user convenience for this reason. Moreover, it is now easier to clean the juicer with a wider pulp outlet and its smart cap prevents juice dripping. EVO820 enables mixed juicing and easy cleaning, so it was highly recognized for its convenience. As the “flap-gate” type chute accommodates round fruits and long ingredients, you can insert and get extract from ingredients more easily. Furthermore, the leather pattern on the front design makes the product itself as well as your kitchen looks more sophisticated. The excellent performance of Kuvings’ EVO820 juicer has already been highly recognized at the “Spark Awards” in the United States and the “Red Dot Design Award” in Germany by being chosen as a Finalist and a Winner, respectively. Kuvings is a leading kitchen appliance brand loved by health conscious people in over 80 countries. We strive to develop the highest quality products that make healthy living more efficient, convenient and delicious.